As a Texas homeowner, you work hard to select unique plants, trees, shrubs, and flowers to make the outside of your home and landscape beautiful and welcoming. When night falls, you may not think much about your home’s exterior, however adding landscape lights can make a huge difference to the aesthetics of your home. Landscape lighting can turn a dull backyard from basic to fantastic, but undertaking a lighting plan on your own can be an intimidating project. Luckily, the lighting professionals at M&M Lighting are here to provide you with landscape lighting tips so you don’t have to go at it alone. 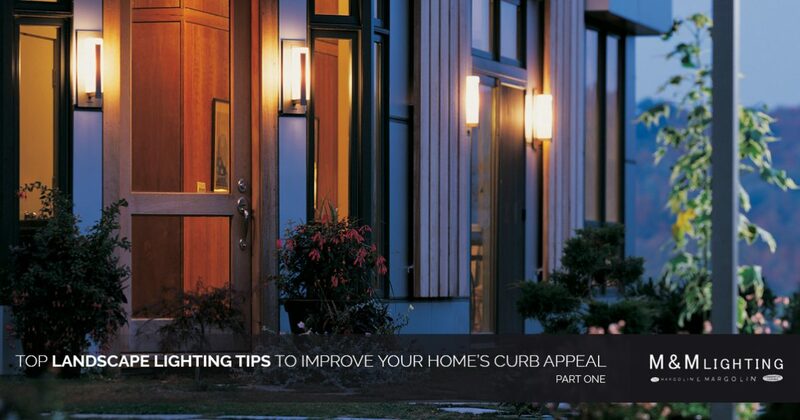 In this blog, we’ll take a look at what to illuminate in your yard, the different types of landscape lighting, and how to properly use landscape lights. 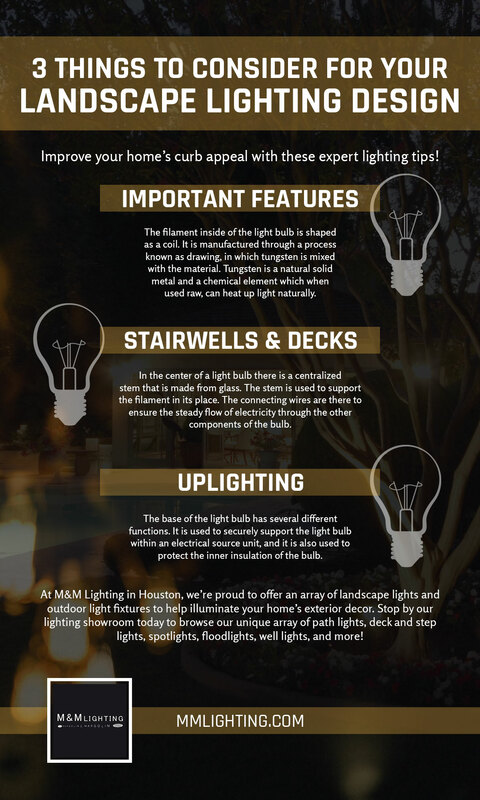 If you live in Texas and you’re looking for the perfect lights for your home’s exterior, be sure to stop by M&M Lighting’s showroom in Houston today. In addition to landscape lights, we also carry an extensive selection of outdoor lighting, sconces, fans, ceiling lights, and more. When it comes to your home’s landscape, you may be wondering what items are best to illuminate and what items should be left in the dark. Let’s look at three important things to consider when it comes to your landscape below. If you like certain features in your yard, be sure to write them down. Maybe you have a small pond that sits next to an elegant tree that you love to lounge by. Perhaps you’ve planted a garden that you wish to light up at night. Whatever you decide to highlight, make a point to write them down. This will help you later on when you start looking for landscape lights and decorations. Are there areas of your yard that don’t necessarily stand out during the day? A simple garden stone can take on a whole new personality at night when it is highlighted with light and shadow. Consider the functionality you wish to create in your yard. If you have a backyard deck with stairs that lead down to a pond or pool, you’ll want to make sure the walkway is well lit. This will not only help you avoid injury, it will add a pleasant aesthetic to your backyard as well. As you can see, there are several different things to consider before you start shopping for new landscape lights. It’s important to remember that the main goal of landscape lighting is only to see the effect of the light, not the light source itself. The exception to this rule is walkway and path lighting, which is designed for both functionality and decoration. In part two of this series, we’ll take a look at the different types of landscape lighting designs available so you can be ready when it comes time to illuminate your yard. In the meantime, visit M&M Lighting in Houston for an impressive array of landscape lights, outdoor lights & more!